2016 is turning out to be all about glitz and glamour. Vibrancy and colours - lots of colours - have always been a major part of Indian weddings. However, we’re witnessing a shift from the traditional toward the more contemporary where monochromes or monochromes with accents seem to prevail. Contemporary couples are going more chic and elegant in their choice for wedding themes. The focus is on sophistication, while maintaining the rich and fantastic vibes Indian weddings personify. Metallic like glittering gold is now no longer just about bride’s jewellery, all the shimmer of the colour gold is now a latest addition to the wedding theme colour palette. So, this week we show you how to play with the colour palette of red, white and gold to give your wedding a chic contemporary twist. 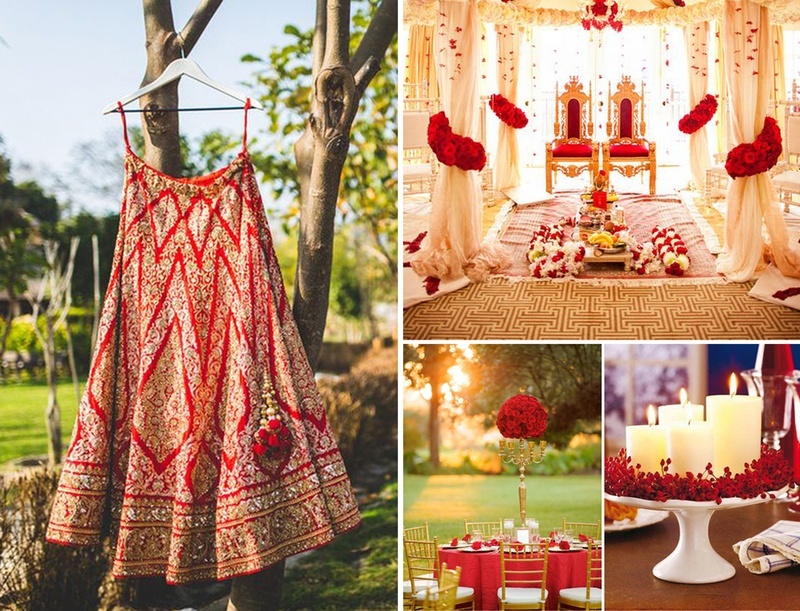 We know, you’d say red is a tricky colour and it will clash with the bride’s outfit. Don’t you get worked up there! From wedding invitations, decorations for weddings, bridal outfit to footwear, we’ve collected some great inspirations that you cannot go wrong with. Get scrolling! Create your own little garden, throw in lots of red and white flowers. Play along with drapes as well. Remember the trick of the trade we mentioned earlier – One colour dominates while others accentuate. With cutlery in most table setting being white, you can either keep your table runners, napkin and chair drapes gold, while the centrepiece can be red or vice versa. For a more glitzy glam wedding you can choose glittery gold or shimmery red table covers. If going vintage or royal, sparkling crystal add-ons hit a harder note. Wedding Centrepieces have come a long way from being mere brass or crystal vases filled with fresh and succulent flowers. Tower candle stands, lanterns, food trays decorated with candles and flowers, unique shaped glasses filled with fruits, flowers and crystals have replaced the mundane. A Centre of attraction mainly at Christian weddings, wedding cakes have come a long way from being just a creamy treat cut while raising a toast to the newly wedded couple. With watercolour, print and metallic techniques taking over, having a traditional wedding cake is simply a put off. When other elements of your wedding are so gorgeous, why leave this one out? Though it may be a great consideration to serve ice cream as dessert at your summer wedding; its high time you give that thought a pass. There’s a very famous saying that states – “Food goes to the stomach, dessert goes to the heart”. So, win the hearts of your guests with these cool red, white and gold wedding dessert ideas. Modern brides these days are ditching rich reds and adopting lighter trending hues, such as fuchsia, blush pink, lime green and more. But, for the brides who like it traditional and want to don a heavy bridal look, because you will never ever get to dress this grand ever again - These bridal wear design suggestions will blow your mind! From contemporary styling with heavy borders, bold embroidery to light details and minimal designs, we’ve selected the best inspirations for you. How Dare We Ignore The Footwear? When it comes to footwear, we always repeat the same mantra – Comfort is key! Stay tuned, we have lots more such themes ideas coming up. Until then, you check out what are the other trending wedding themes here.